The office suites are some of the most ancient tools that have been crafted since computers began to be used at home and in the office. The story goes back to 1994, when began developing the proprietary office suite StarOffice, created by the German company StarDivision. From there free packages and owners succeeded without interruption. No doubt one of the great stars of the office is the Office suite from Microsoft. Considered the benchmark for great compatibility and relative ease of use, have not taken any free software packages in a battle with the Microsoft package. 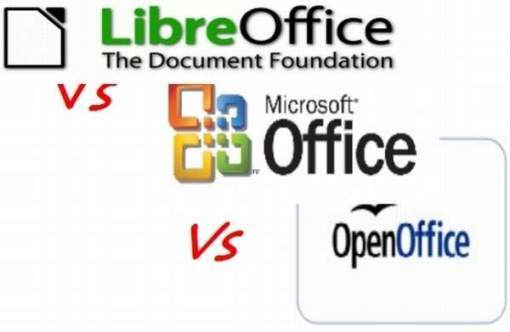 OpenOffice and LibreOffice are those that have faced in recent years the power of Microsoft. Undoubtedly the most obvious and decisive difference between them is the fact that Microsoft tools are not free; it is necessary to go through the trial version limited to 30 days later having to buy the product or follow the monthly subscription model. Instead, free alternatives are completely free. Now, there is talk that the free ones are not fully compatible with Office formats, including on issues of formatting a simple style sheet, or in the case of some presentations and organizing spreadsheets. LibreOffice is the suite that has gained more followers within the free software. Compared with Microsoft Office, includes common tools: word processor (Word/Writer), spreadsheet (Excel/Calc) and presentation manager (Powerpoint/Impress). LibreOffice also includes its own vector graphics editor (Draw), an editor of mathematical formulas (Math) and database manager (Base). So the question is served. Some prefer to step on known ground and continue using Office (even in versions 2002). Others consider that both Free as OpenOffice are better, even when they have commented on various forums, problems when wanting to work with files saved in Office or vice versa.